BF Series bag filter vessels are construct of heavy duty carbon steel (stainless steel is optional) with a 304 stainless steel perforated basket. The vessel is rated at 150 PSI. A 'buna N' gasket is used to seal the lid. 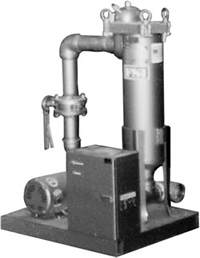 Process Flow Rate : up to 600 GPM. Available Filters: 5, 10, 25, and 50 micron.